MELVILLE, NEW YORK, November 26, 2007 - FONAR Corporation (NASDAQ-FONR), The Inventor of MR Scanning™, announced today at the 93rd meeting of the Radiological Society of North America (RSNA) in Chicago a groundbreaking invention in the diagnosis and monitoring of scoliosis. The patent-pending breakthrough utilizes new software and a new receiver coil developed for the unique FONAR UPRIGHT® Multi-Position™ MRI. The dramatic result is a single picture of the entire spine in the upright position (SEE PHOTO). A National Cancer Institute (NCI) Report shows a 70% higher risk of breast cancer for women with scoliosis (www.cancer.gov/newscenter/scoliosis2000). The NCI report says, "Researchers have found that women with scoliosis, or abnormal curvature of the spine, who were exposed to multiple diagnostic X-rays during childhood and adolescence may be at increased risk of dying of breast cancer.... The 5,466 women in the study, who received an average of 24.7 X-rays, were found to have a 70% higher risk of breast cancer than women in the general population." The report goes on to say that "although radiation exposures to breast tissue are much lower today than during the time period covered by this study, they are not insignificant." Raymond Damadian, M.D., president and founder of FONAR, said, "I'm delighted to announce our invention for the radiation-free evaluation of scoliosis with the FONAR Dynamic™ UPRIGHT® MRI. An accurate evaluation of scoliosis requires the patient to be upright. A conventional recumbent-only static MRI cannot meet this need. Of critical importance, our radiation-free application can be performed in the same amount of time and at the same cost as diagnosis and monitoring by X-ray. I believe it's imperative that every hospital and practice performing scoliosis examinations consider providing their patients with the radiation-free choice that is finally available because of the unique benefits of the FONAR Dynamic™ UPRIGHT® MRI." The FONAR images provide coronal, sagittal and axial views of the entire spine - with no radiation. The 3-plane visualizations are achieved by 3-D acquisition with curved multi-planar reconstruction. Both the Cobb angles and the angular rotation of the vertebrae are measured. The FONAR UPRIGHT® MRI has another important advantage over X-ray. It sees, not only the curvature of the vertebrae, but the soft tissue, including the spinal cord, intervertebral discs, nerve roots and spinal ligaments. "This application to scoliosis is just the latest of many unique advantages found only on the FONAR UPRIGHT® MRI," continued Dr. Damadian. "Last week we reported on the landmark independent study by the UCLA School of Medicine, which reported the comparison of Dynamic™ UPRIGHT® MRI with static Upright MRI in more than 1,000 patients (1,301). A significant overall 'miss rate' of 18.1% by static MRI was cited. 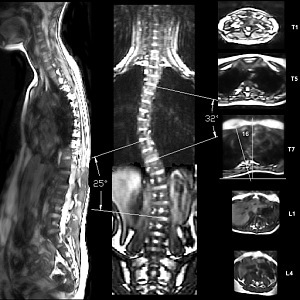 This large study proves the diagnostic advantages of FONAR UPRIGHT® Multi-Position™ weight-bearing MR imaging."